Our gorgeous little lady Bella has given birth to the most amazing mixed litter of babies. 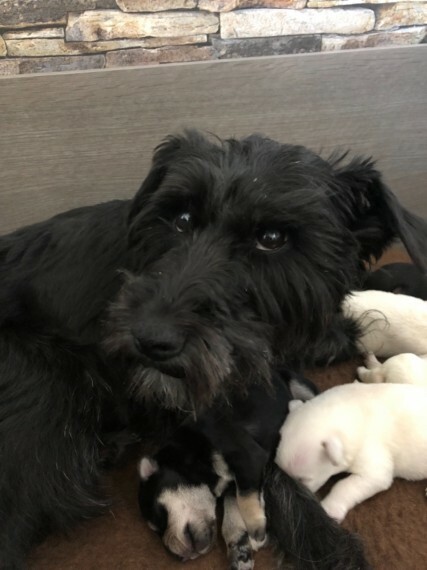 Bella is black in colour and can be viewed with the pups dad is demon he is salt and pepper pictures of demon can be given if required but he will not be seen with the puppies. We currently have available Black and silver boy 1400 Pure white girl x2 1400 Jet black boy 1400 Pure white boy 1400 Black and silver girl 1400 Your new addition will come with full pedigree papers along with kc registration certificates he/she will also come home with 4 weeks free insurance first injection and micro chip along with veterinary checkup also fully wormed and fleed. He/she will come to you with food and toys and support from us to help your little one settle in with you. A none refundable deposit will be required to secure you little one of 100 the remaining balance will be required on collection either in cash or via bank transfer prior to collection. Please feel free to ask for individual pictures or to come and view at a convenient time for you, any questions we will be happy to answer for you so please don?t hesitate to get in contact. Adopting, or buying a new puppy or dog is an important decision and big responsibility. As an owner, you will solely responsible for the welfare of your new pet and will also be financially committed. Before you decide to buy or adopt you must ensure that you’re 100% committed beforehand. For further information on caring for puppies and dogs, please visit our pet advice section. You can also find out more information about the Miniature Schnauzer breed by visiting the Miniature Schnauzer Dog Breed Information.